Travelling, or just need some extra pet care help? You can find a perfect pet sitter on Pawshake. Pawshake has thousands of trusted and verified pet sitters who offer their personalised pet care and pet minding services straight to you. Pawshake knows your furry friend deserves the very best pet care. Our pet sitters are highly experienced and provide high-quality pet daycare, pet boarding and dog walking for your furry friend. What is a Pawshake pet sitter? Pawshake pet sitters are friendly locals from your neighbourhood who, quite simply, adore spending their time caring for animals! The Pawshake website is a perfect place for our pet sitters to offer their high-quality pet care services straight to you and your furry friend. Pawshake pet sitters come from all walks of life - some might be veterinary students or nurses, retirees with some free time and space for pet care, or even families and couples who would love to host a furry friend but can’t commit to owning their own pet yet. Whatever your pet sitter’s background, you can rest assured that they have joined Pawshake because of their dedication and true love of pets. Pawshake doesn’t operate like a traditional dog kennel or cattery - instead, we offer personal, flexible, home-based services that can fit in with what suits you and your furry friend best. Why is Pawshake pet sitting a better choice? Choose pet boarding or house sitting for your pet when you are away from home for a few days or more. Your dog can stay active with dog walking. A pet sitter can cuddle your cat during regular home visits,and can also care for your rabbit, guinea pig, fish or bird. Get to know each other with an obligation-free meet & greet - you can be sure your pet is in the absolute right hands. Found a perfect pet carer for your critter? Book securely via Pawshake for premium pet insurance, 24/7 online support and our satisfaction guarantee. Every pet is unique and special. On Pawshake, you can choose a perfect pet sitter for your individual pet care needs. You won’t be out of pocket for the very best personal pet care: our affordable rates are individually set by our pet carers. Premium pet insurance covers your pet in case of illness or injury and third parties for your peace of mind. Pay securely online for automatic insurance coverage throughout the booking. You’re in safe hands with Pawshake. All pet carers on Pawshake are individually vetted by our team of specialists: less than 20% of potential applicants make the cut. All Pawshake pet carers must have a detailed profile with information on their experience, pet care background and authentic reviews. Our loving pet sitters are 100% dedicated to your cat, dog, rabbit, bird or guinea pig. Delight in daily updates and photos from your pet sitter during the booking period. Plus, our friendly customer support team is online to assist you 24/7. Should the pet sitter you have arranged and booked be unable to care for your pet, we will do everything we can to find you a replacement. This is very rare, but we are there to help and support you if you get stuck. Using Pawshake for the first time? Leaving your pet behind when you go away for work or on a holiday can be a stressful experience. With a few simple steps you can know that your pet will be relaxed, happy and in safe hands. Read your pet sitter’s profile carefully. You can browse reviews from previous bookings and check their availability on their calendar. If the pet sitter looks promising, send them a message with your pet care requirements and dates. Always arrange a meet and greet with your pet sitter before formalising your booking. Take your time to get to know each other - ask a lot of questions and answer any questions the pet sitter may have. If your meet and greet is successful, formally book your pet sitter through the Pawshake website. 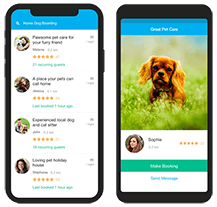 This will active our premium pet insurance coverage for the booking period, protection from the Pawshake guarantee and the support of the customer support team throughout the pet minding booking. Need your pet cared for and unsure what to book? Here are definitions of all pet sitting services on Pawshake. This service is for pet owners who want their pet to stay overnight in the comfort of the pet sitter’s home. Doggy day care (or pet day care) is perfect when you want a pet sitter to take in your pet at their home during the day. Dog walking can last from around 30 minutes to an hour and is a good way for your dog to get some extra exercise with their pet sitter when you are too busy to walk them. Home visits (either one or two per day) is great when you want a pet sitter to visit your home from 30 minutes to an hour during the day. The pet sitter can feed your pet, have some playtime and a cuddle with your pet. A pet sitter can offer in-home pet care by staying with your pet at your house. This allows your pet to maintain their usual routine and avoid the stress of changing location.